Linda Hanson and son Mathew took to the stage at World Dairy Expo in October 2017 to share a Virtual Farm Tour and to detail their experiences from when they first began to consider an automated feeding system for their dairy operation to where they are at today, about one year after start-up. 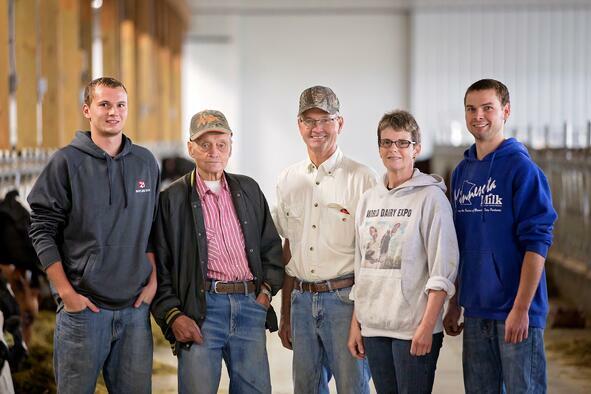 Mike and Linda Hanson are the third generation of Hansons on Good-Vue Farms in Goodridge, Minnesota and they will likely pass on the business to their sons, David, Mathew and Steven. As their sons began joining the ranks in day-to-day operations, the family realized they were at a crossroads. Should they continue raising their herd in the tie-stall barn they built in 1994 or should they make the transition into dairy automation? 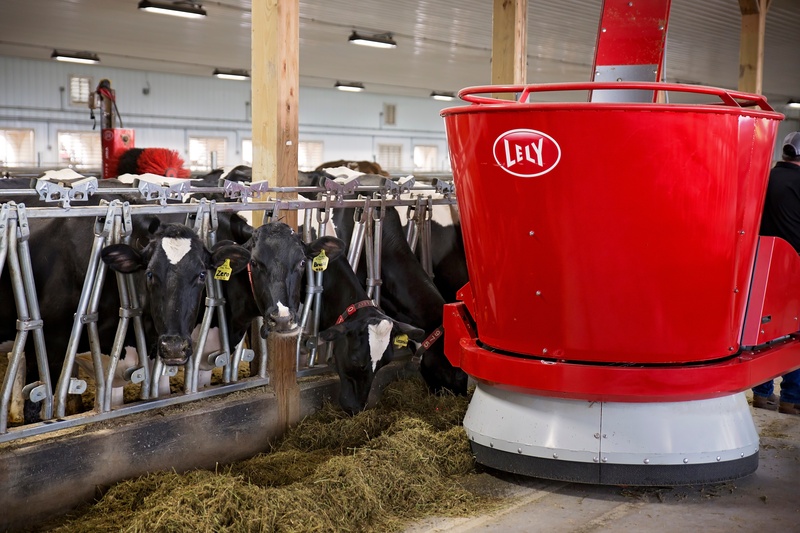 It only took one trip into Canada to visit a farm with a Lely Vector automated feeding system for them to make their decision. The Hansons chose to join the ranks of dairy automation and have built a new, free-stall barn that boasts two Lely Astronaut A4 automated milking systems, a Lely Vector, three Lely Luna cow brushes and the Lely dairy herd management software, T4C (Time for Cows). They made the transition in September 2016 and have seen a 10 lb bump in production since that time. Plus, feed refusals have dropped, which means less time cleaning the bunks. That frees up the family to spend more time on breeding, cow-health and – oh, yeah – farming about 2,800 acres of land. Their herd of registered Ayshires and a few Holsteins took to the feeding system right away. It only took one trip from the Vector for the cows to realize where the fresh feed was being delivered. The Vector system now feeds lactating cows 10 to 11 times daily and the Astronaut milking system lets them be milked when they want. The result? A quiet and calm barn and a more relaxed herd. It’s not only the cows who are reaping the benefits from this more relaxed atmosphere. The Hanson family also appreciates the intangibles the Vector and A4 offers them, such as being able to go to town and not worry about getting home to mix feed or milk the cows and not having to open up barn doors for the tractor and wagon during those frigid Minnesota winters. “My knees and hips felt better in about 24 hours,” says Linda Hanson.